He was born in Calcutta, West Bengal. 1938 While painting on the Madras beach, caught the attention of Rajgopalachari, who offered to send him abroad, but the college authority did not agree. 1943 One of the founders of `Calcutta Group`, Calcutta. Joint Secretary of Academy of Fine Arts, Calcutta. Traveled widely in Europe and America. Studied at Anglo-Bengali College, Allahbad. 1931-35 Diploma in Painting, Maharaja School of Arts and Crafts, Jaipur. 1935-38 Diploma in Sculpture, Govt. College of Art and Craft, Madras (Student of D.P. Roychowdhury). Solo Exhb., Bombay, Delhi and Calcutta. 1940-47 Exhb., organized at the Birla Academy of Art and Culture, Calcutta. 1947 Exhb., AIFACS, New Delhi. 1952 First solo exhb., No. 1 Chowringhee Terrace, Calcutta. 1979, 80 Art of Bengal- Heritage of Bangladesh and Eastern India, White Chapel Art Gallery, London. Exhb., Manchester City Art Gallery, Manchester. 1987 Exhb., Chitrakoot Art Gallery, Calcutta. 1995 Exhb., Birla Academy of Art and Culture, Calcutta. 1997 On 50th Anniversary of Indian Independence, Gopal Ghose, The Pre- Independence Years, Birla Academy of Art and Culture, Calcutta. Mukand and Neerja Lath, Jaipur. Neville Tuli and Osians Connoisseurs of Art Archive, Mumbai. The indigenous orientalism of the Bengal School was on its wane when Gopal Ghose appeared on the Indian art scene. He retained his love for open nature. 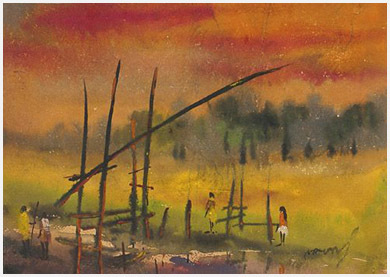 Although rooted in the findings of the European Expressionism, he re-interpreted the `art of landscape painting` as practiced by the Bengal School. 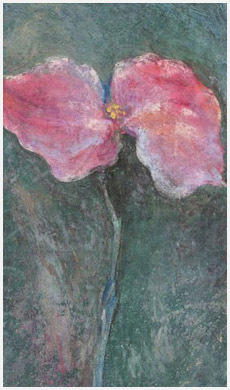 He handled watercolour, tempera and pastel with an effortlessness that amazed the connoisseurs of his time. Became Art Teacher in the B.T. Dept. of Scottish Church College, Calcutta. 1940-45 Taught at Indian Society of Oriental, Calcutta. 1945 Taught architecture drawing, Faculty of the Bengal Engineering College, Shivpur. 1950-72 Joined as teaching staff, Govt. College of Art and Craft, Calcutta.